A Tudor inspired brick and shingle façade presents a timelessly classic entry to this lovely residence on a peaceful cul du sac at the top of Issaquah’s historic Squak Mountain community. Inside, the traditional architecture gives way to light filled and voluminous interior spaces that have been carefully updated and optimized for modern family living. On the market for the first time since its construction in 1994, the home features five bedrooms, three and a half baths and numerous large scale, multipurpose areas for recreation, entertaining and relaxation. With gorgeous mature landscaping, expansive deck and patio areas and over 4000 square feet of interior space on three levels, this is an ideal enclave for the active family. The house is divided into three levels with varying degrees of communal public space. The main floor is devoted to entertaining and everyday family activities with a grand foyer, formal living and dining rooms, a home office and a spacious den that opens directly into the kitchen and an additional great room off the back of the house. Sliding doors open onto a large deck and patio that offer tons of private, shaded outdoor living and entertaining space. The second level is comprised of an expansive master suite, three additional bedrooms that share a large full bath, and a massive upstairs great room with another full bath attached. Finally, a staircase from the great room leads up to a third floor bedroom that is perfect for teenagers or guests. This is a house that masterfully combines a crisply traditional aesthetic with contemporary materials, surfaces and space planning to yield an environment that is casually sophisticated and luxuriously enveloping. Warm, neutral colors compliment oak and Brazilian cherry hardwoods that cover most of the floors, while elegant white trim, wainscoting and casework helps to define and unify the interior spaces. 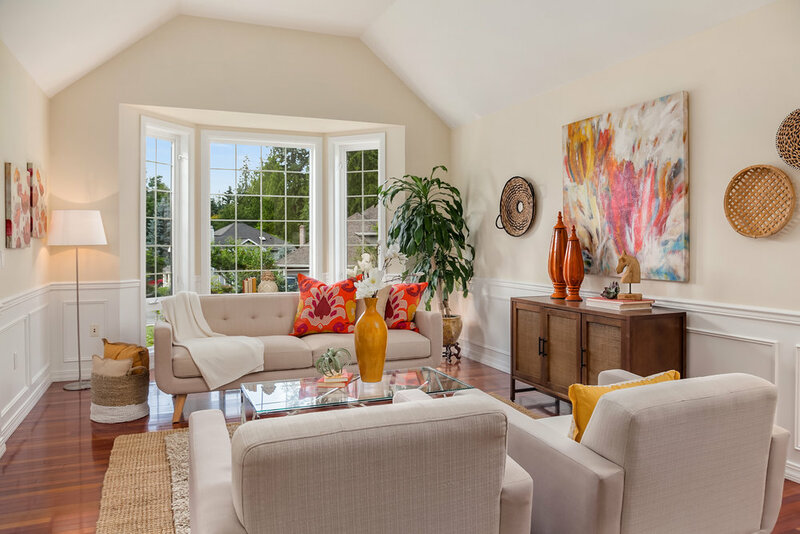 Vaulted and tray ceilings combine with oversized windows and skylights to create a great sense of volume and flood the home with natural light. Wide archways provide gracious flow from room to room, and travertine baths and exotic stone surfaces create everyday luxury. A dramatic two-story recessed entry leads into the open and soaring foyer, with its elegant central staircase and views to second floor. To the left, lie the home’s more formal public spaces. These consist of a gracious living room with vaulted ceilings, wainscoting and a bay window overlooking the front gardens, as well as a step up to a similarly scaled dining room that gazes out over the backyard. The private home office sits to the right of the entry, with a double tray ceiling and large windows for airy natural light and views. A wide hallway leads under the staircase and past the powder room into the house’s dynamic and open family areas, which comprise a large gourmet kitchen that overlooks the family room, and an attached great room that is perfect for large events or indoor recreation. The kitchen is ideal for the active family or regular host. It features both an island and a peninsula with casual seating and counter space galore, as well as custom cabinets, a home organizing station, exotic slab granite counters and ample recessed lighting. The appliances include GE Profile gas cooking, double wall ovens and refrigeration, with a Miele dishwasher and a double corner sink set into a bay window that overlooks the back deck. A discreet sliding door opens to the formal dining room for easy service. The sunken family room is just a step down from the kitchen, and offers a spacious and comfortable retreat for casual relaxation. It is anchored by a fireplace set into a wall of built-ins, with audio and video connections to facilitate television and home theater. The den opens directly into the 15’ x 25’ great room toward the back of the house that can easily facilitate large-scale dinner parties or a wide range of indoor games, from ping pong to pool. A pair of sliding doors leads out to the sun-drenched deck and a more shaded patio that function as outdoor dining and living rooms, respectively. A hallway off the den contains both the laundry and mudrooms, and affords access to the oversized, two-car garage. 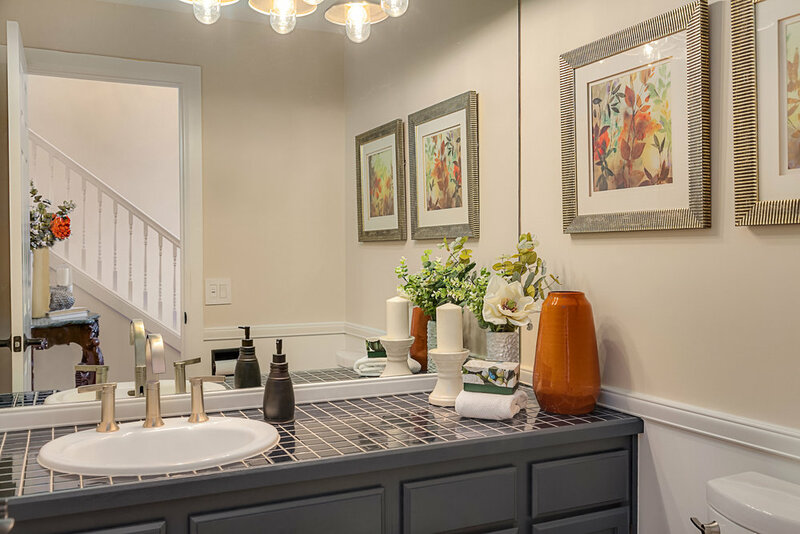 The wide and open central staircase leads up to an expansive landing that overlooks the entry and provides access to the master suite, upstairs great room and three additional bedrooms that share a full bath. The master bedroom is a calm and restful retreat that looks over the backyard through a wall of oversized windows. 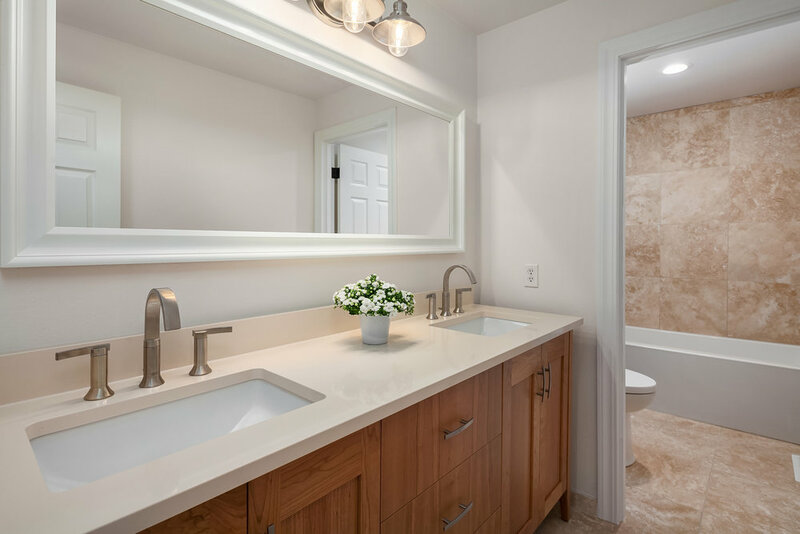 It features dramatic vaulted ceilings and a walk-in closet, as well as an opulently appointed ensuite bath with travertine tile, two vanities, a deep, free-standing soaking tub, and a two-person, walk-in shower with double rain head fixtures. 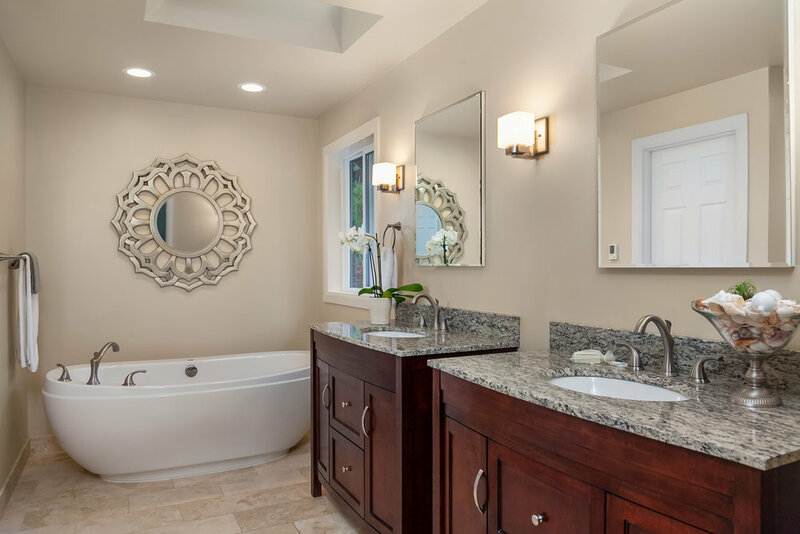 To the front of the house, three additional bedrooms share a large and beautifully appointed bath with a custom two sink vanity, travertine floors and a deep soaking tub in a separate room. The central hallway leads back past the master suite and into a spectacular second floor great room with vaulted ceilings, its own travertine bath and a sunny deck that looks out over the backyard. This unique, multipurpose space is great for use as a playroom, media lounge, library or study, and can easily be converted into a semi-autonomous apartment for live-in help or multi-generational family. It includes a discreet staircase that leads up to the third floor bedroom area. This is a charming, under-eave space with skylights and a closet that is ideal for guests or older children seeking a touch of privacy and independence. 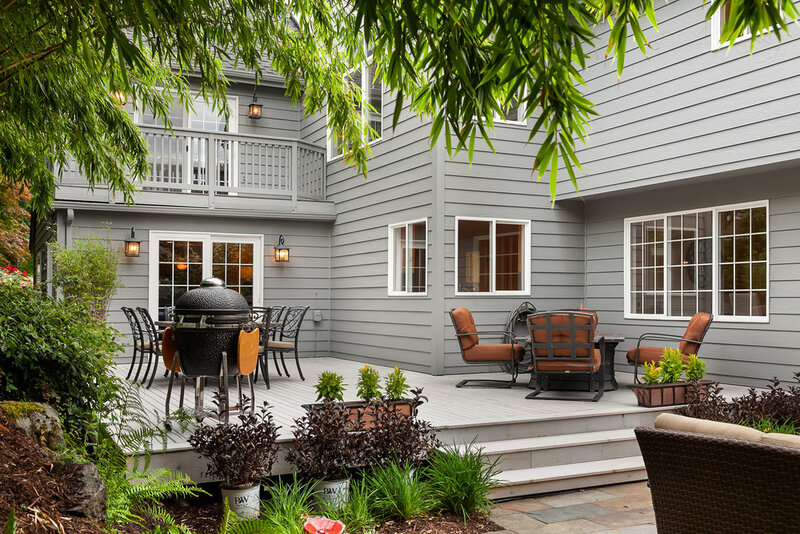 Outdoor spaces in this residence are treated as additional living space, with an expansive, sun-drenched and level deck, defined by the kitchen and family areas, that steps down to a more shaded slate patio in the back corner of the lot. Lush, mature landscaping surrounds the house, providing natural privacy screening and attenuated shade. 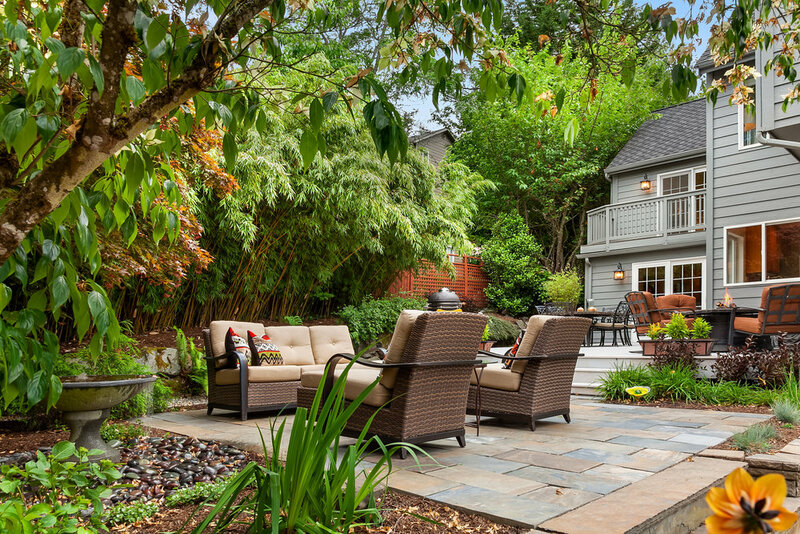 There is plenty of room for outdoor entertaining, or for three-season relaxation around a fire pit. The two-car garage is extra deep and tall to facilitate shop and storage space, and is accessed by its own staircase off the mudroom and laundry area. The Squak Mountain community is a historic and eclectic 100-year-old settlement, just a mile above downtown Issaquah. It offers a sun dappled, natural setting that blends seamlessly with surrounding native forest and plant life, while also conveying a laid-back, low-key sensibility with access to award-winning schools, great shopping and entertainment. The neighborhood offers easy and direct access to the I-90 corridor, Eastside tech and the cultural and business opportunities of Seattle, while also sitting at the gateway to numerous outdoor activities from hiking to skiing, world-class golf to paragliding. This is the ultimate home for the active or multi-generational family seeking sublime comfort, room to spread out and enjoy, and access to a diverse array of pass times. With a history of devoted ownership, meticulous care and regular updates, it is poised to provide many years of care-free and delightful ownership for its next stewards.